Earlier this week, I was at the 2016 Evolution meeting in Austin, Texas. 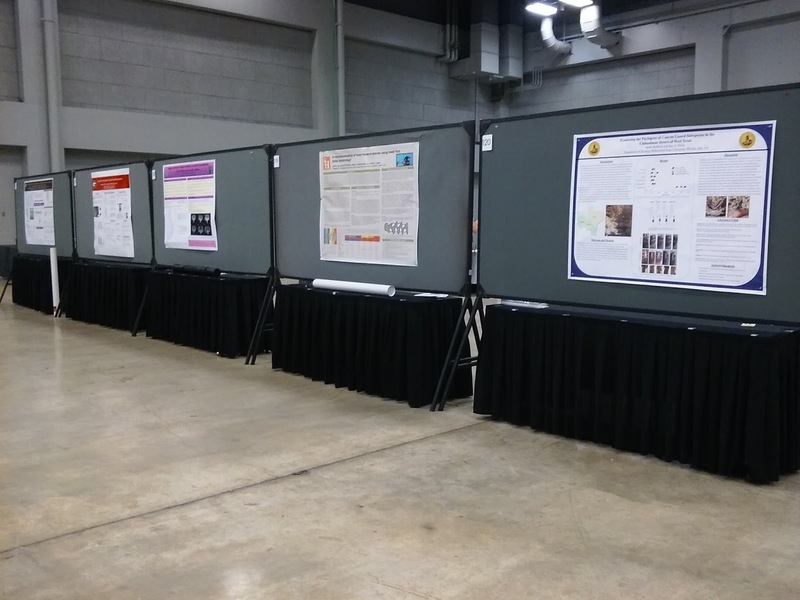 The poster sessions ran for three nights, two hours a night, and I glanced at every single poster. The conference organizers underused their poster boards, as shown in the picture above. The instructions said that posters were supposed to be no wider than four feet, but the boards were probably seven or eight feet wide. This is a shame; I would have loved to use the whole space available. I wonder if the organizers were expecting more poster submissions. A few last minute posters were two to a board, and maybe they told people to keep posters small so they could double up on boards if necessary. But even if the conference organizers had told people they could make wider posters, I don’t think many people would have taken them up on it. I saw many posters in portrait format: very tall, skinny, and dangling off the bottom of the board. They looked awkward. I saw enough of them that I don’t think they resulted from accidental misreadings of the instructions. People reusing posters from other conferences, maybe? Each poster had ample square footage. There was plenty of space between the aisle, so no presenter or audience member was in danger of getting tramples. The room the poster sessions in were very well lit. The small tables underneath the poster boards were very handy places to put food and drink. The conference did a great job of keeping poster presenters feed and hydrated. There was quick good snack food and drinks available in the evening poster session. Despite having tables to put things on, very few posters had any sort of physical takeaways for readers. Only a couple had letter-sized versions of the poster or business cards. Rafael Marcondes had the winning poster in the American Naturalist poster competition, and it’s archived here. (Hat tip to Rafael Maia.) In addition to Rafael’s poster, a few other Evolution conference posters are archived at Figshare. There’s about 30 posters archived out of maybe 400 that were presented. I was super excited to meet a few blog readers. Thanks for chatting! Update: Hat tip to Rafael for reminding me of some valid points about the sessions. presentation board printing services - Get high-quality, professional and good looking presentation boards at print247365.com. We can print, design, and customized your board according to you instructions? Print247365 offer online order and free home delivery all over the world. What is the “ePoster” format?